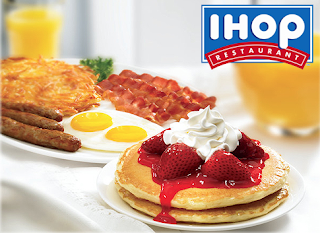 Steward of Savings : IHOP Restaurant: (3) FREE Entree Coupons! + FREE Beverage Refills! IHOP Restaurant: (3) FREE Entree Coupons! + FREE Beverage Refills! Go here to sign up>> IHOP Restaurant: (3) FREE Entree Coupons! Enjoy (3) FREE Meals when you join the My IHOP Pancake Revolution Club! 4) Request a meal substitution entree if you don't want pancakes, ex: Burgers or Chicken Tenders, etc. Important: Be sure to choose the location you plan to visit to redeem coupon, or the Manager will NOT honor the coupon! Also, If you are NOT in the mood for pancakes, no problem, you can use your credit for a different entree of your choice! Lastly, don't forget to request your FREE Beverage Refills! Tip: Print your coupon at your local library if you don't have a printer!